Find out why the city continues to draw crowds year after year…. Summertime converts the city of London into a niche playground for powerful spenders. Russians, Americans or women in hijab step out of their sleek Maybachs in Harley Street, discreetly flashing their sparkling huge Graff rocks whilst visiting the best cosmetic specialists or splurging in stores and spas with the latest beauty-enhancement technologies. Here, you can be anyone you want to be. Stroll through art galleries and historical museums or walk the streets of Camden and mingle with people from any genre, inking your memories with a tattoo. Warning: when visiting the city of Sherlock Holmes, stay inseparable from your umbrella ’cause the rainy skies can unpredictably spout everything from a light mist to a thundering, unrelenting deluge. Don’t let that dissuade you, however, from visiting these exceptional places in the city…. An eye-catching array of stunning bespoke diamond, ruby, sapphire and emerald jewellery, beautifully crafted in 18-carat gold, a rare watch or a single diamond can all be acquired under one roof. The store is an indulgent stopover for the discerning spender. A valuable jewellery repair service is gladly offered to international clients. 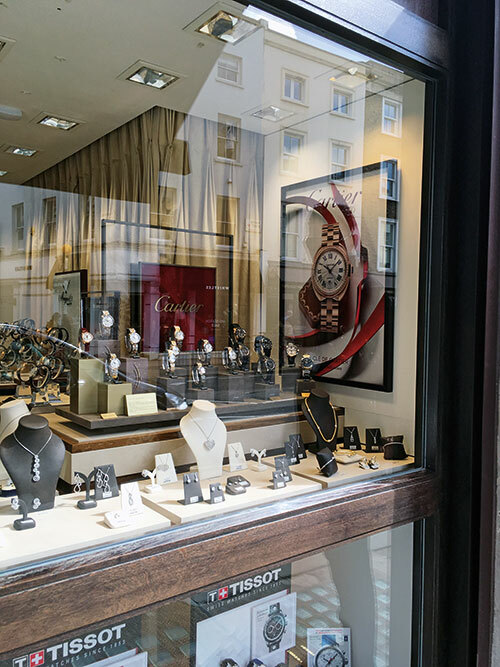 The luxury store is the official agent for Cartier, Jaeger-LeCoultre, Breguet, IWC and Omega watches. An antique pewter bar, hanging pendants, marble tiles and red leather banquettes create a casual environment for all-day dining. 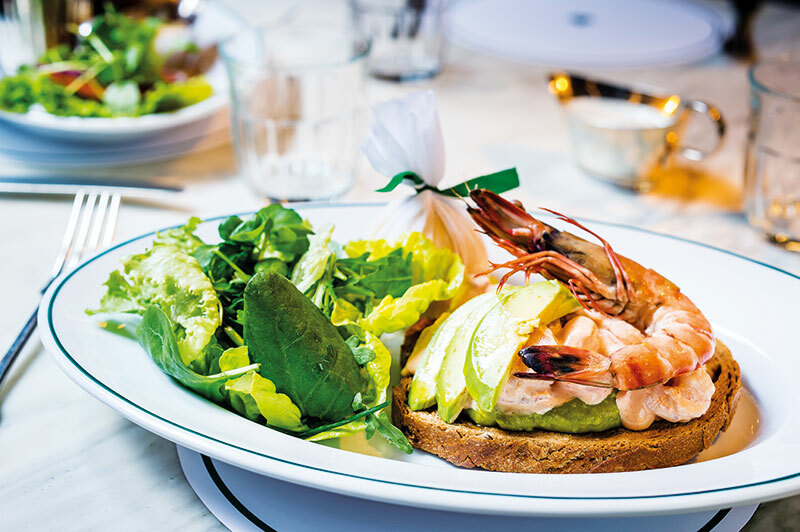 The menu consists of the French lady’s favourite, croque madame (ham hock, Gruyère cheese, Dijon mustard and béchamel) and seared scallops, truffled potato, lamb’s lettuce served with parmesan crisp and grated truffle among others. Sweet cravings can be satiated with salted caramel balls and the espresso martini is served with an unsweetened hot cross bun and an amaretto and crème brûlée infusion — deliciously decadent on those extended girlie afternoons! This multi-brand, contemporary, spacious, luxury store is open seven days a week and stocks eye-catching fashion garments from designers Ermanno Scervino, Antonio Berardi, Carven, Acne and Emilio Pucci, in addition to the store’s own brand, Joseph. Shoes from designers Giuseppe Zanotti, Tod’s, Alexander Wang and Paul Andrew, and gorgeous espadrilles by Paloma Barceló make for perfect accompaniments. A top-to-toe personal styling experience is offered. Sought-after fashion designers from India and Pakistan compete for rack space at this stylishly modelled Asian store. A riot of colours, rich fabrics and innovative concepts marry Western silhouettes, producing beautifully cut clothes. High-quality merchandise including beautiful saris, lehngas, churidars, angrakhas, men’s bandhgalas, kurta pyjamas, silk scarves, cashmere shawls, kundan jewellery and hand-embroidered evening bags make for compelling buys. Celebrities fly in for the signature oxygen facial which starts with deep cleansing, steaming and gentle extractions, followed by an application of a micro glycolic serum to remove dead skin cells and soften lines. Medical-grade oxygen, enriched with vitamin serum, is applied to the skin for its firming, anti-ageing and healing properties. No wonder Madonna, Victoria Beckham and Colin Firth have repeat appointments here. Devoted to exceptional hairdressing techniques imparting indulgent experiences in a relaxed atmosphere, innovative hair treatments are offered by highly skilled experts, enhancing customer experience. Complimentary professional consultations are available without an appointment. 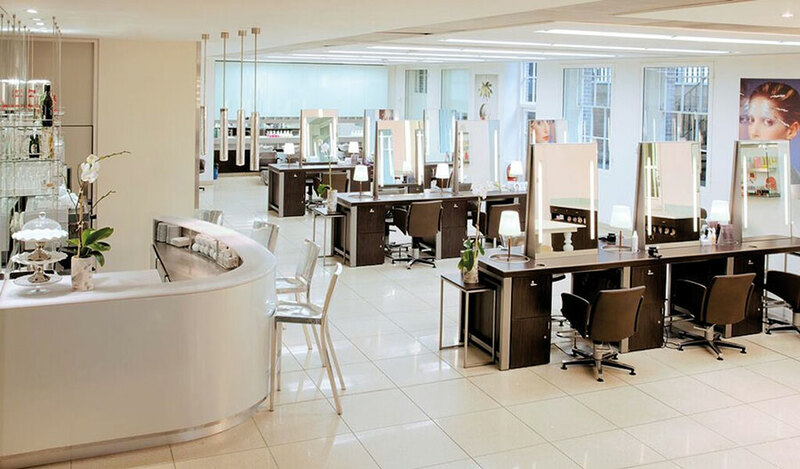 Contact Manuel for a cut and blow-dry and colourist Louise Vyse to shade your tresses. are seasonal must-haves. They stock Gucci, Stella McCartney, Balenciaga, Alexander McQueen, Chloe, Yves Saint Laurent, Sergio Rossi, Marc Jacobs and Anya Hindmarch. Caters to high-fashion-aware women who want to step out to shake a leg, garbed in the latest styles of the month. This all-day dining venue pays homage to the Irani cafes of old Bombay. The decor is quirky vintage and the walls are styled with bright Bollywood film posters. Mouth-watering signature dishes that instantly satiate homesick cravings include bhel puri, chicken berry Britannia (a biryani influenced by the recipe used by Britannia & Co in South Mumbai), spicy lamb kheema peas with butter pao bun and Punjabi black dhal with roomali roti. These are all worth sampling along with the heady Bombay colada (pineapple and vanilla infused with coriander, chai syrup, lime juice and rum). Often inhabited by celebrities Jeremy Irons and Sharon Stone along with global Asian expats, Russian oligarchs and partying sheikhs (halal menu available). Surroundings lend homage to old-world Shanghai with black lacquered woodwork, intricately carved screens and dimly lit mood lighting. An esoteric crowd knows what they are seeking in this specialised gourmet Chinese den. 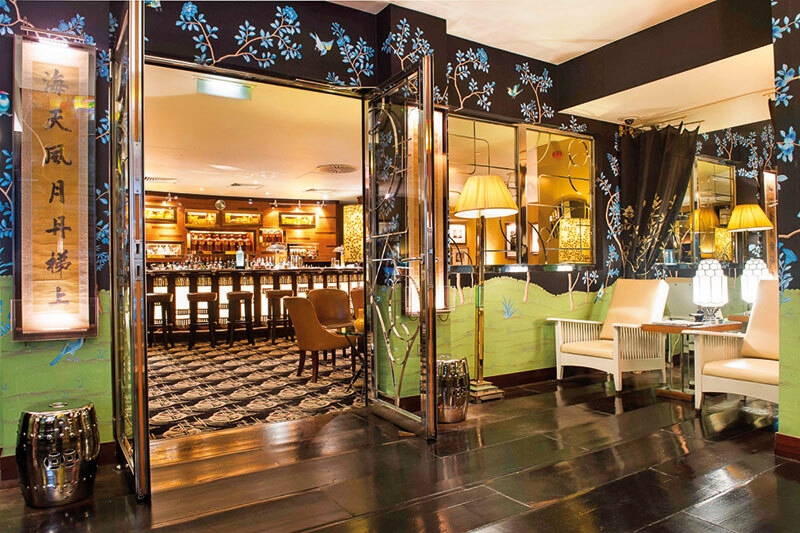 Andre Balazs has turned a former firehouse into a swanky boutique hotel and the restaurant, headed by Chef Nuno Mendes, offers diverse seasonal dishes with influences from Portugal and America. Try indulgent fresh crab noodles with chilli, ham and dried tomatoes, crunchy chicken skin Caesar salad with anchovies and parmesan and the sea trout crudo with yellow mole apple and coriander. The courtyard garden exerts a romantic pull with potted plants and shaded tables that are perfect for giggling girlfriends sipping Bellinis at lunch. Voted the ‘world’s best bar’ consecutively for a few years, the drinks have a theatrical flair and are served with surreal garnishing by their mixologist who uses clever imagery to seduce guests. 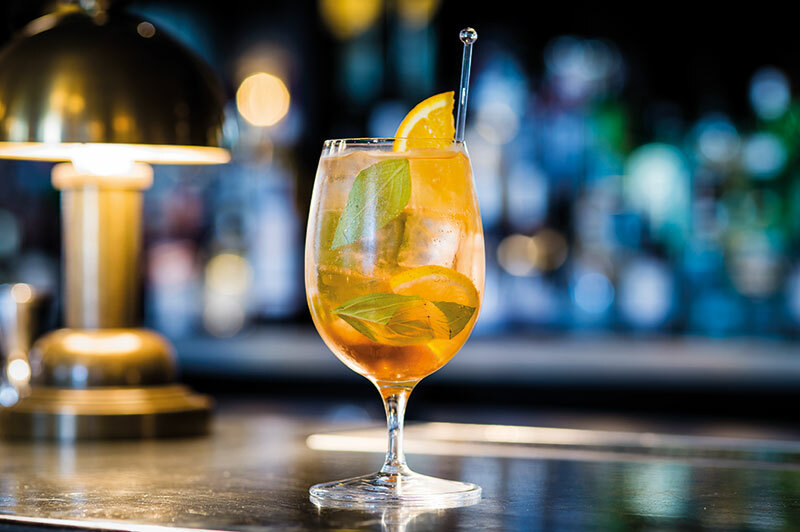 The cocktail called spring drifting into summer feeling awesome has fantastic combinations of ketel one, shochu, artichoke, coffee, yuzu, passion fruit and coriander, and the popular suspended in time #FeelingPretty is fused with Star of Bombay, lime, niaouli yarrow and palmarosa. But the scene-stealer is chameleon crystals feeling amazing, a heady drink fused with Tanqueray No Ten, pisco, lime, perilla, chilli and soy. 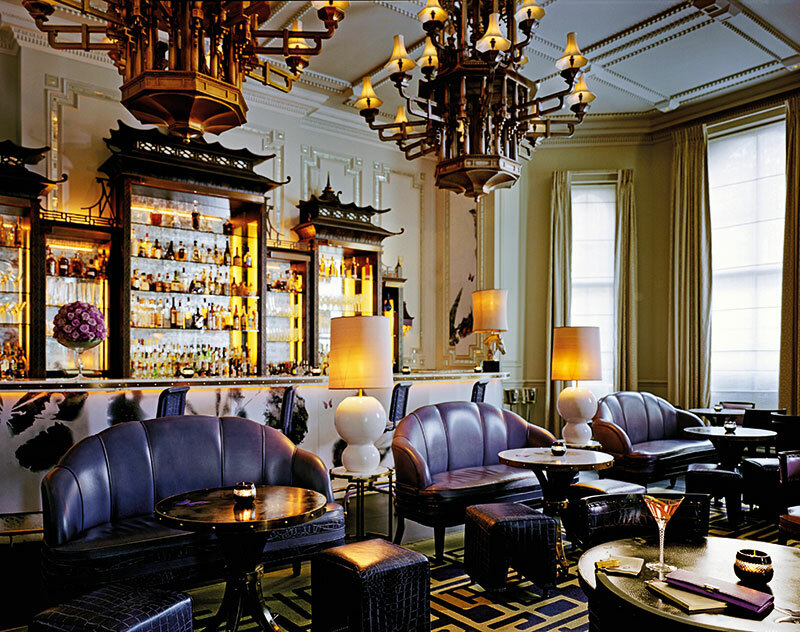 A belle époque spot, to see and be seen for networking corporates and celebs. Lady Gaga and Justin Bieber have been spotted sipping their favourites here. Sitting here on cold wintry mornings gives you the feeling that you are having a heart-warming love affair with old Viennese cafe society. 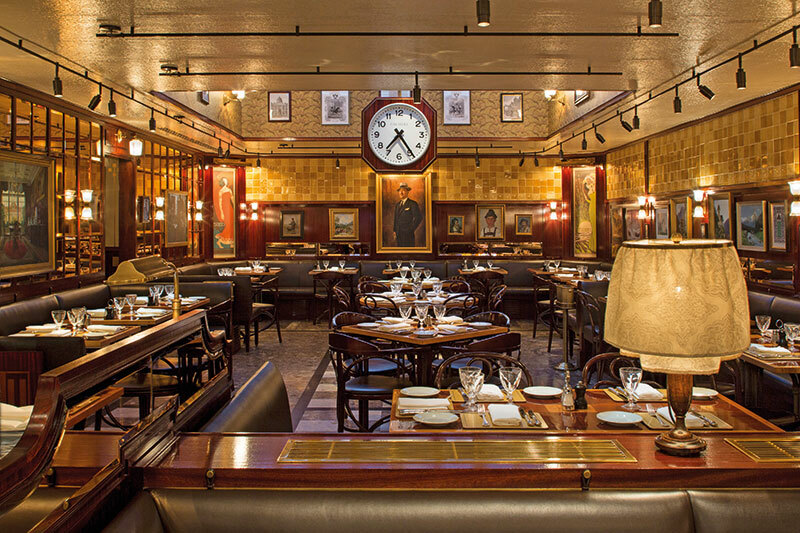 It has all the decor of the Austro-Hungarian era; a rich black and brown palette, oil paintings, glistening tables and an oversized clock hanging in the centre of the room. An off-the-beaten-track Viennese breakfast includes smoked ham, beef sausage, salami, artisan Gouda, boiled egg and a pretzel or the Austrian gröstl served with paprika crisp, fried potatoes and onions, bacon and a fried egg. Ametsa means ‘dream’ in Basque. It’s for those fascinated with experimental molecular Spanish cuisine and a learning curve for those who believe it’s only about a few classic tapas. The spacious restaurant overlooking a garden square has a wave-like ceiling with thousands of suspended test tubes filled with multitude spices, exhibiting their kitchen’s global knowledge of ingredients. Michelin-star heroes San Sebastian, Juan Mari and Elena Arzak excel at tricking the imagination with a modern twist to Basque-influenced dishes while simultaneously exciting the taste buds with tantalising flavours.